NORTH ANDOVER, Mass. - Despite piling up 70 shot attempts - more than double that of their opponents - the Merrimack College men's ice hockey team suffered a 1-0 setback against Lake Superior on Sunday afternoon at Lawler Rink, securing a weekend sweep for the Lakers. After a scoreless opening frame, the Lakers went ahead 37 seconds into the second period on a goal by Max Humitz that ultimately wound up being the difference. That score went unchanged the rest of the stanza despite 11 shots on goal and three power play opportunities for the hosts, who found themselves behind by a goal heading to the third. Merrimack had some golden chances early in the third - a fact that would be thematic for the entire period - but Lake Superior goaltender Mareks Mitens was the difference down the stretch, coming up with 14 of his 31 total stops in the final frame to preserve the lead and, eventually, the victory. Goal #1 (LSSU, 0-1): Max Humitz's second goal of the weekend broke a scoreless deadlock 37 seconds into the second period. Brayden Gelsinger entered the zone from the right side off a pass from Humitz and skated the puck underneath the dots. He then found Humitz with a backhand pass to the slot, and the latter went hard to the crease and punched the puck in on his second attempt after initially being denied. - Senior Craig Pantano made his first start of the season in net and was very strong, stopping 23-of-24 shots he faced (.958 SV%). - Freshman Chase Gresock, who picked up his first career assist in Saturday's season opener, was equally impressive on Sunday despite not recording a point. He led all players with six shots on goal and was buzzing all night, particularly in the final minutes of the game with the Warrior net empty. - Senior Derek Petti won 10-of-19 faceoffs to account for the Warriors' top performance on the dots. 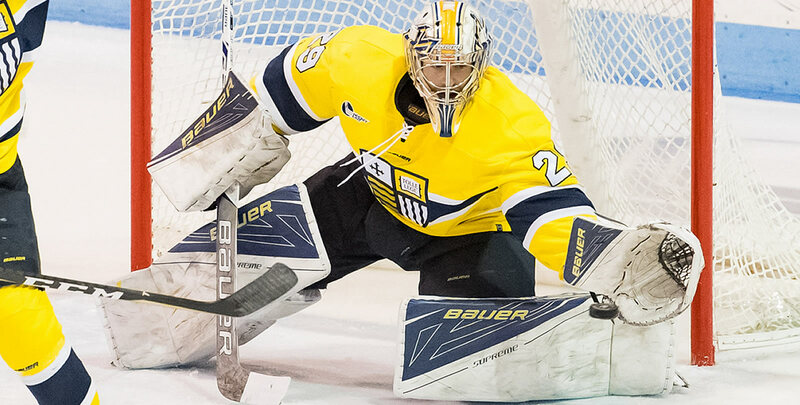 - Merrimack outshot Lake Superior, 63-43, on the weekend. - Lake Superior pulled ahead in the all-time series, 3-1-0; it was the first meeting between the two schools since March of 1988 when they met in the 1988 NCAA Tournament Quarterfinals. - The Lakers blocked an impressive 18 shots on Sunday. - Both power plays, one night after combining for five goals on 11 attempts, went a combined 0-for-10 on the day Sunday. Merrimack hits the road for a two-game swing against a pair of Atlantic Hockey opponents next weekend starting with a Friday (Oct. 12) matchup at nearby Waltham to take on the Bentley Falcons. Game time is set for 7 p.m.